Minister says riders should be allowed to use cycle tracks. "Past research has shown that user conflict on shared use routes is actually infrequent but exaggerated, and that additional maintenance cost to ensure appropriate surfacing is minimal. "I would urge all local authorities to allow horse riders to use cycle trails, routes and any other ways where it is in their power to do so, and to encourage that permission or dedication to happen where it is not in their power. Unless there are good and specific reasons not to expressly allow horse riders to use such routes, local authorities should take steps to accommodate them. "Local authorities should be making the most of their off-road networks through integration of use. Multi user routes have been shown to be readily adopted and well appreciated by local people. Where they are done well they bolster community cohesion and create a better understanding between users." The good news there is that he is actually asking for an explanation from the LA's. I shall look forward to seeing what they have to say for themselves. Do you think local authorities will agree? The British Horse Society warmly welcomes the support for the use of cycle routes by horse riders offered by Richard Benyon MP, Minister for Natural Environment and Fisheries. Reinforcing a point frequently made by the BHS, the Minister makes clear that "Past research has shown that user conflict on shared use routes is actually infrequent but exaggerated, and that additional maintenance cost to ensure appropriate surfacing is minimal." Mr Benyon urges all local authorities to allow horse riders to use cycle trails, routes and any other ways where it is in their power to do so, and to encourage that permission or dedication to happen where it is not in their power. In the Government's view: "Unless there are good and specific reasons not to expressly allow horse riders to use such routes, local authorities should take steps to accommodate them. Local authorities should be making the most of their off-road networks through integration of use. Multi user routes have been shown to be readily adopted and well appreciated by local people. Where they are done well they bolster community cohesion and create a better understanding between users." "This is something for which the BHS has been campaigning for years and the Minister’s request that all local authorities allow horse riders to use these routes is most welcome." In the 60s cyclists were keen to accept as of right their legal use of Public Bridleways so why has it taken so long for horse riders to be allowed on cycle paths? At last - a Minister who is on the side of horse riders as well as having some sense!!" "It is great news to hear parliamentary support to get horses off the roads. I hope this really leads to change. Riders don't like being on the roads and neither do road users and it seems criminal to force riders to use roads, particularly during the week when perfectly suitable footpaths etc could be used without causing damage. Perhaps if there was a real issue at certain points riders could walk if necessary or warnings be issued at vulnerable points. It seems so unfair that these paths can't be used if we could walk or trot when we are unable to trot or canter at bridlepath points where the ground has been tarmaced or gravelled. We need to encourage all ages to get out and appreciate our countryside in order to learn how to respect it and from that will come tolerance. Our countryside is one of Britain's natural assets and it is far better to encourage people to use it than export our disposable income and airplane gases to foreign countries in search of environmental enjoyment. Yes, there might be compromise but learning how to do so encourages a better community too so the benefits are exponential. And then there are safety benefits, insurance and financial benefits. The list goes on." 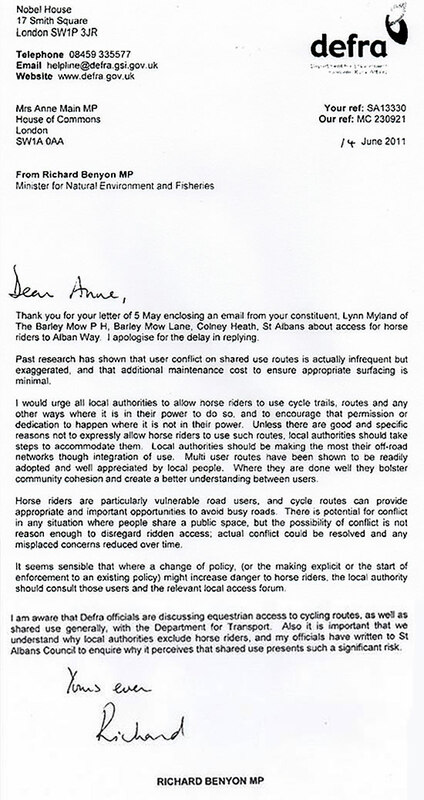 "Regarding horse riders using cycle trails and any other routes where it is possible to have safe equestrian access, I can confirm that the Hertfordshire County Council Rights of Way Service's stance is that we encourage land owners, developers and other partners to do so wherever and whenever it is in our and their powers to do so, as Richard Benyon says in his letter to the MP for St Alban's in Hertfordshire. "I have seen some of the national research which has shown that user conflict on shared use routes is actually infrequent and that reflects our overwhelmingly positive experience here in Herts. "We also find that if there are any additional maintenance costs, to ensure appropriate surfacing for example, these are minimal and we have been following this approach for many years. "The Rights of Way Officers, of which we have 2 who are regular horse riders / owners (with good BHS & BDS contacts) and others including myself, who ride or have ridden occasionally, start from the stance of multi-user routes and only compromise where we have to, for example because of safety or engineering difficulties. Our old railway lines are promoted as multi-user, one including horse and carriage driving and, in any negotiations for new or altered routes, we start from the position of multi-user.
" Where development occurs this usually gives us the best opportunities to ask for enhancements to the fragmented bridleway network and we will go for dedication first or permissive second, to try to make that happen. If the integration of differing user groups also bolsters community cohesion and helps create a better understanding between users, then so much the better."